Christine Peacock practiced performance arts (acting, directing producing fringe and community theatre) in Sydney and the UK before training as a television producer with ABC Television, Sydney. She is writer, producer, and director with Brisbane based Indigenous community media-arts organisation Uniikup Productions Ltd. (originally Murriimage Community Video and Film Service) established in 1986. Christine directs Uniikup’s annual Colourise Festival staging media-art events in collaboration with community creActives, events and venues (details atwww.colourise.com.au). Christine completed an MA (Research) 2009 and PhD 2015 at the Creative Industries Faculty, Q.U.T. Brisbane, researching the media-arts processes and practice she developed in the Brisbane Indigenous community over 28 years. She is descendent of land, place, people and history that is Erub in the Torres Strait Islands, born in Mareeba North Queensland (bordering on Kuka Yalanji and Djabuganjdi countries) and grew up in Ningy Ningy country at Redcliffe SE Queensland. She is a parent of two and grandparent of one. Colleen Johnson is currently based in Bundaberg, Queensland – her father’s hometown which is situated within the boundary of the Gooreng Gooreng peoples of South East Queensland. She wrote, acted, co-directed and edited a short film called "Bachelors of Batchelor" as a student of Batchelor Institute of Indigenous Tertiary Education which is located two hours inland from Darwin, Northern Territory. Graduating with a Diploma of Screen and Media, Colleen won the CAAMA Media Award for this little film which showcases the Batchelor township along with a flavour of comic storytelling. Prior to this, Colleen also completed a Diploma of Creative Writing at the Institute which allowed her the privilege of combining and complementing her learnings at the all Indigenous Education Institute. Jenny Fraser was born in Far North Queensland and her old people originally hailed from Yugambeh Country in the Gold Coast Hinterland, near the South East Queensland and Northern New South Wales border. In 2015 she was the first Murri to have her video art imprinted on a gold record and broadcast into outer space via Hobart and Cape Canaveral, Florida in the Forever Now project, as a follow-up to the Voyager Golden Records sent into space in 1977 by NASA. 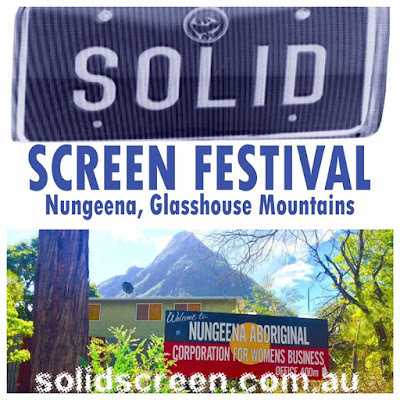 This is the second SOLID SCREEN Festival and Retreat that she has presented. Jules Koostachin was born in Moose Factory Ontario, and raised by her traditional Cree speaking grandparents in Moosonee, and with her mother, a survivor of the Canadian Residential school system. Jules is from Attawapiskat First Nation, Mushkekowok territory, and currently resides in Vancouver where she commenced her PhD at the University of British Columbia. Michelle Blakeney is a Yaegl woman from the Far North Coast of New South Wales. She has been a photographer for several years, and her continuing passion and ambition is to document her own people's unique culture and history through photography. It is this healing power of photography that fuels her love of the medium. Currently a resident of Sydney, Michelle branched out from her photographic practice to encompass screen-based practice. Semah Mokak-Wischki - a Djugun woman was born in Broome and raised at Adelaide River in the Northern Territory. 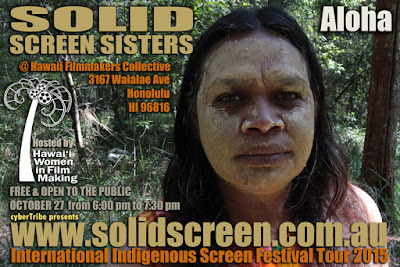 She wrote and directed Through Our Eyes, a documentary which explores issues being brought up Aboriginal and Muslim (selected West End film festival 2011). Semah works in disability and currently lives in Brisbane. The Stingray Sisters are incredible Kunibidji women from remote Aboriginal community Maningrida, NT. These sisters speak their native language ‘Ndjebbana.’ GRACE EATHER, 23, is the baby. She’s confident, makes everyone laugh and loves to party. ALICE EATHER, 26, is the go-to woman. She’s the educator, the committed activist and very popular. NONI EATHER, 29, is the rock. She’s an amazing mother herself and she works in child welfare. As the eldest, she bares the brunt of every family problem. Non-Indigenous Director Katrina Channells completed a Bachelor of Fine Arts in Film and Television, graduating with distinctions from Queensland University of Technology. In 2012 Katrina conceptualised, wrote and directed the popular presenter-led children’s show ‘P-Culture’, a 10-part, interstitial series for ABC3. Zoila Margarita Jiménez Pacheco was born in 1978 and is a native of Merida, Yucatan, Mexico. She studied at the Autonomous University of Yucatán in the Faculty of Anthropological Sciences in the specialty of Social Anthropology and completed her thesis "Religious diversity. Beliefs and rituals in a Mayan community. " Zoila has been interested in issues such as religious diversity in Indigenous communities, international migration and the integration of young people into the labour market. Her work experience focused on the work of social research at the Department of Social Sciences at the Autonomous University of Yucatan, in the CIESAS Peninsular, The University of Florida and the Center for Comparative Migration Studies at the University of California-San Diego. Cultural Enterprise Management in A.C., l Institute for Sustainable Development in Mesoamerica and currently in Haciendas del Mundo Maya Foundation. Parallel to her academic training, Zoila has also been dedicated to developing skills in audiovisual media, taking up photography in 1998 in analog and digital techniques. She is part of the Kayche Collective that runs the the Film and Video Festival Kayche' Tejidos Visuales, which is a window that evokes dialogue in order to promote self-representation and demand catalysts for change in an unequal world. Lori Blondeau is a Cree / Saulteaux / Metis artist originally from Saskatchewan. Blondeau holds an MFA from the University of Saskatchewan, and has sat on the Advisory Panel for Visual Arts for the Canada Council for the Arts and is a co-founder and the current director of TRIBE, a Canadian Aboriginal media arts organization. Her contemporary practice, includes both visual and performance art. Michelle Derosier was named 2011 Female News-maker of the Year by Wawatay News in Canada, and is an award-winning filmmaker who brings her twelve years of experience as a front line social worker to bear on her drama and documentary film work. Co-owner of Thunderstone Pictures, she works as a producer, director, writer, and occasionally even as an actor in Thunder Bay. Penny Evans was born in Sydney in 1966. She has been a practicing visual artist for the past 30 years working in ceramics, printmaking and mixed media. More recently Penny has had a foray into film making facilitated by completing a Screen Media course. As well as The AB-Sorption Method, she has produced and directed The Girls of Goonellabah a documentary screened on NITV. Penny is based in Lismore, NSW. Fiona Foley is a Brisbane-based artist and exhibits regularly in Australia and internationally. In 2009, the University of Queensland Art Museum and Sydney’s Museum of Contemporary Art co-curated a survey exhibition of Fiona Foley’s work, titled Forbidden. The exhibition traversed photography, sculpture, moving image, etching and installations. During 2011 Foley was appointed an Adjunct Professor with the University of Queensland. Jenny Fraser was born in Far North Queensland. She is a 'digital native’ working within a fluid screen-based practice. Having worked on short films and docos, her practice as an artist / curator has also been partly defined through a strong commitment to collaboration with others, leading to founding networks such as the Blackout New Media Arts Collective, and cyberTribe, an online gallery that facilitates the production and exhibition of Indigenous art, internationally. She has completed a Master of Indigenous Wellbeing at Southern Cross University in Lismore, New South Wales. Hiona Henare has spent over twenty years in the Māori creative industries as a producer, writer, director and performer. She is deeply dedicated to the advancement of Māori Theatre, Contemporary Dance, Film and Broadcasting. She is the former Executive Officer of Nga Aho Whakaari, the Film & Television industry guild representing Maori practitioners. She is currently on the executive board of the Wairoa Maori Film Festival and the TeNati Tahitian Film Festival. Madeline Hodge was born in Brisbane in 1945, from the Bigambul Clan, then was assimilated and educated in Brisbane City, but has lived mostly on the Gold Coast. Madeline has been a painter, sculptor, lecturer, writer and involved in the Arts for over 40 years. She has been commissioned to do murals and other acquisitions all through Queensland and is in private collections all over the world. Colleen Johnson is based in Far North Queensland. She wrote, co-directed and edited a short film called "Bachelors of Batchelor" - influenced by attending Batchelor Institute of Indigenous Tertiary Education. Graduating with a Diploma of Screen and Media, Colleen won the CAAMA Media Award for this doco comedy film. Darlene Johnson is a director and actress based in Sydney. Her first short drama, Two-Bob Mermaid (1996), won the Australian Film Critics Circle Award for Best Australian Short Film. 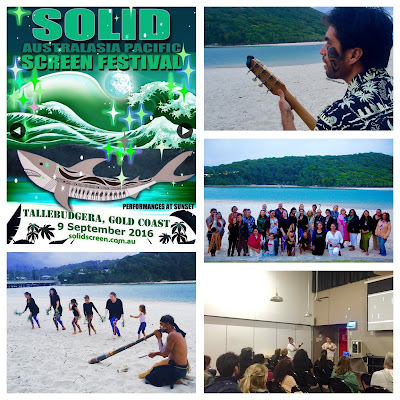 It was nominated at the Venice Film Festival for the Baby Lion Award, won the Best Dramatic Short Film at the 41st Asia-Pacific Film Festival and is now used as a standard teaching resource in primary and secondary schools Australia-wide. Lily Shearer has a B.A. in Theatre, Theory and Practice from the University of Western Sydney and has over 25 years experience in Aboriginal women’s dance, heritage, culture and theatre making practice. Lily is a founding member and Executive Producer of Moogahlin Performing Arts. Her work with Moogahlin includes Lesson in Flight for the 2008 Dreaming Festival, Gathering Ground 2010 and Posts in the Paddock in association with My Darling Patricia. r e a was born in Coonabarabran, New South Wales, into the Gamilaraay/Wailwan people and currently lives in Sydney. In 2004 she received a Fulbright Scholarship for research and development in creative technologies and she recently received a New Media Arts Fellowship from the Australia Council for the Arts. r e a 's work is held in the collections of the Australian Museum, the Art Gallery of New South Wales and the National Gallery of Australia, among others. Active as a curator and artist, r e a has participated in numerous group exhibitions, residencies and conferences both in Australia and Internationally. Ariel Smith (Nêhiyaw/Jewish) is a filmmaker, video artist and cultural worker currently based in Ottawa, Ontario Canada. Having created independent media art since 2001, much of her work has shown at festivals and galleries across Canada and Internationally. Ariel also works in arts advocacy and administration and is currently the Director of the National Indigenous Media Arts Coalition.